Everyone should know a good curry recipe. 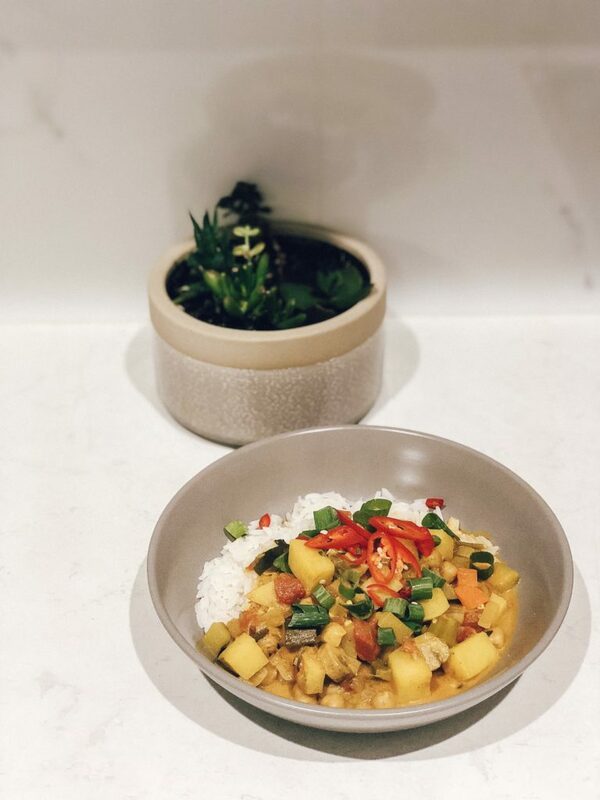 They’re the perfect vegan/vegetarian option for those who are unsure of how to cater for a herbivore friend, plus they’re filling, healthy and bloody delicious. As for this recipe, as always, I pretty much winged it, and this was the first time I’ve made it exactly like this. That being said, I have to admit that after tasting it, I realised that this is possibly one of the most delicious recipes I have ever created. Have I missed my calling as an international vegan chef? Unlikely, but still, this Coconut Chickpea Curry is going to knock your socks off! This is what I mean by ‘healthy’ tablespoon of minced garlic. Dice all vegetables (potato, carrot, zucchini, mushroom & broccolini) into smallish cubes and put to the side. 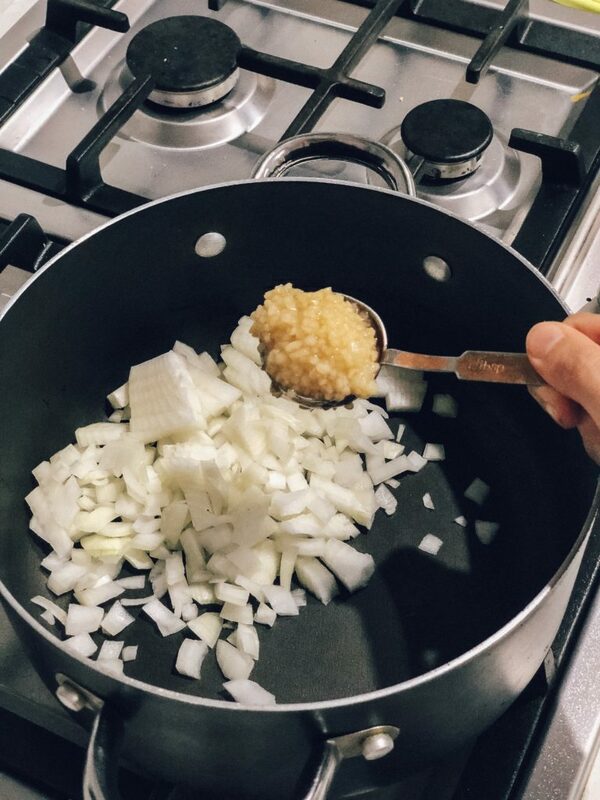 Dice brown onion and spring onion, put in a pot on medium heat with the garlic, paprika & a dash of olive oil and cook for 3 minutes. Add all other vegetables and rinsed chickpeas to the pot and sauté for a further 2 minutes, making sure to stir well. Now is probably a good time to add a good pinch of salt and pepper, too. Add diced tomatoes to the pot, then fill up empty can with water and add to pot along with 2 cups of veggie stock. Add 3 teaspoons of curry powder, put the lid on and bring to the boil. Add coconut cream, then reduce heat to low and simmer uncovered for around 20-30 minutes (or when the potatoes are soft). Serve with rice and garnish with fresh red chilli and the green end of the spring onion. You can swap out the protein if you don’t like chickpeas – other options include tofu, beans or lentils. Chickpeas are the best though so use them. You can also use whatever vegetables you like/have lying around. Everyone always goes on about which rice is better for you, white or brown, blah blah blah. I’m no nutritionist, but I don’t think there is much of a difference when it comes to rice. It is a good source of complex carbs and as long as you’re eating it in moderation, then I think it is great for you. 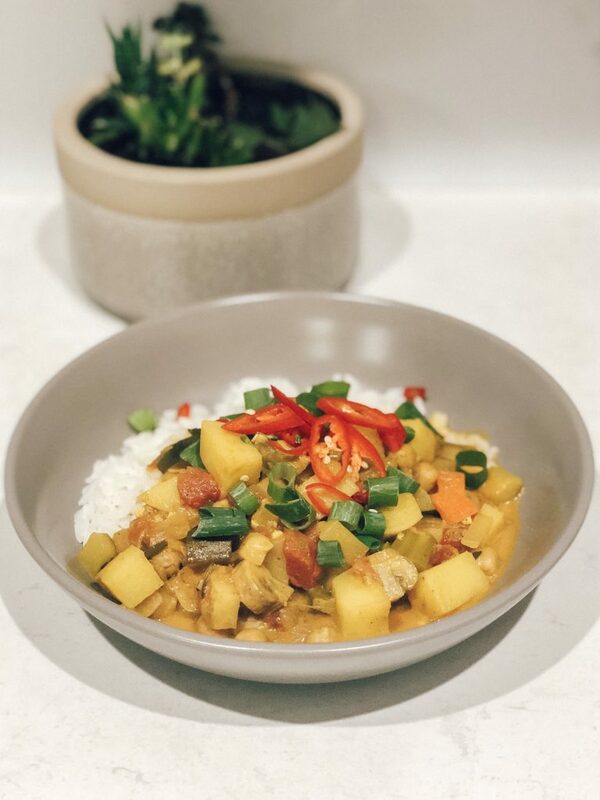 I love Jasmine rice and that is what I used in this recipe, but I also love brown rice, so you use whatever you like best! Sorry for the dodgy photos. Unlike actual food bloggers who care about their images, I write/shoot my recipes as I go and when I’ve dished up, I can only snap a couple of photos before I am devouring the food. Maybe one day I’ll get better at this. 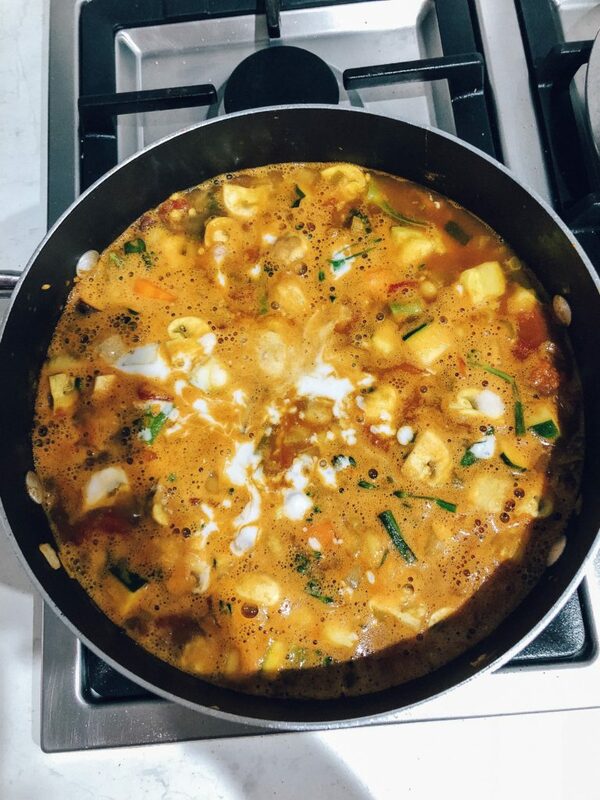 I’m a big believer in simmering to get the flavours out, and in this instance when I made the curry, I turned it off after it had been simmering for about 15 minutes because we had to go play soccer. When we got home about an hour later, I put it back on for another 15 minutes and then served. I have no idea if this made it taste so delicious or not, but I thought y’all should know #fulltransparency.